Name Your Seat is an ongoing campaign to raise funds that helps us to ensure the continuation of WAAPA’s invaluable contribution to the Arts. 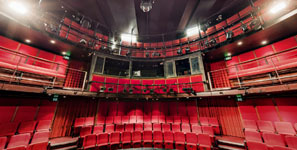 With Name Your Seat, our alumni, proud supporters, staff, students and their families can make an invaluable contribution to the Academy by having a 'naming plaque' placed on a seat in either The Geoff Gibbs Theatre, Roundhouse Theatre or the Music Auditorium. All funds raised contribute towards ongoing projects such as the Annual Showcase tour, the visiting artists program and the purchase of new equipment and instruments. To donate to WAAPA via Name Your Seat, please complete the Application Form or click the 'Apply Now' button.